War in Comics, an exhibition of comics art, will be opening on June 8th at 7 pm and continuing until July 1. Organized by the English Department at Memorial University in partnership with the Royal Newfoundland Regiment, the exhibition will feature the works of Scott Chantler (Two Generals), Miriam Katin (We Are On Our Own), Jason Lutes (Berlin), Wallace Ryan (The Narrow Way), Joe Sacco (The Great War), and Paul Tucker (Tet). On June 8th at 7 pm, Chantler, Lutes, Ryan, and Tucker will give a public talk about their works at CFS St. John’s on The Boulevard. Admission is free, and all are welcome; a reception will follow. Broken Books will be on hand selling copies of the artists’ books. Note that attendees must get tickets for the event at the Arts and Culture Centre, and must present photo ID to gain admission. The exhibition will continue until July 1, accessible to the public during the Royal Newfoundland Regiment Museum’s regular opening hours. Access again requires picture ID. 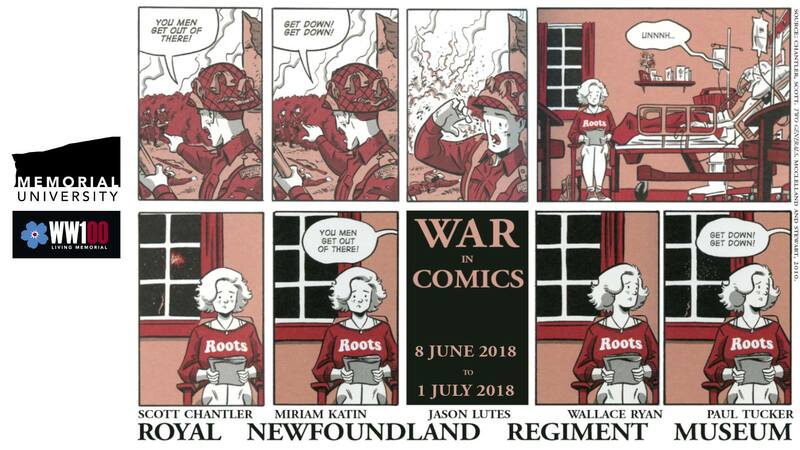 War in Comics gratefully recognizes the support of Scholarship in the Arts, the Memorial Public Engagement Accelerator Fund, and WW100. Please direct any and all inquiries to Dr. Andrew Loman (aloman@mun.ca) and/or Irene Velentzas (ivelentzas@mun.ca).